Global prostate cancer therapeutics market expected to generate revenue of around USD 17,200 million by end of 2024, growing at a CAGR of around 8% between 2018 and 2024. The uncontrolled growth of prostate gland cells leads to prostate cancer. In the U.S., prostate cancer is the one of most common cancer after skin cancer in men. The report covers forecast and analysis for the prostate cancer therapeutics market on a global and regional level. The study provides historic data of 2017 along with a forecast from 2018 to 2024 based on revenue (USD Million). 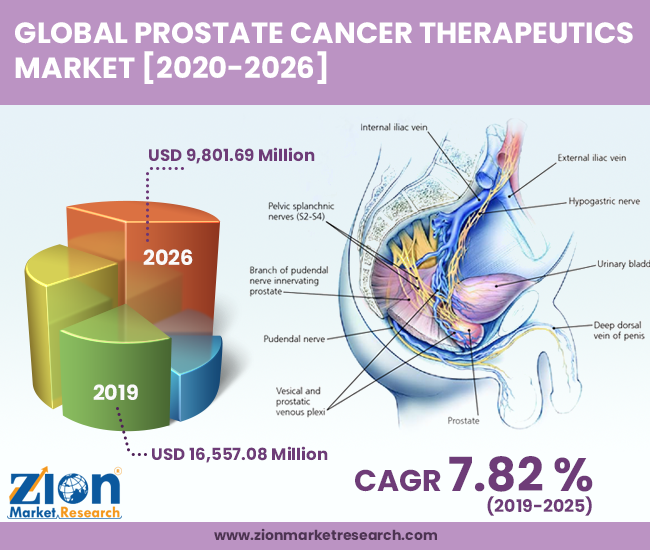 The study includes drivers and restraints for the prostate cancer therapeutics market along with the impact they have on the demand over the forecast period. Additionally, the report includes the study of opportunities available in the prostate cancer therapeutics market on a global level. In order to give the users of this report a comprehensive view of the prostate cancer therapeutics market, we have included competitive landscape and analysis of Porter’s Five Forces model for the market. The study encompasses a market attractiveness analysis, wherein the product type and distribution channel are benchmarked based on their market size, growth rate, and general attractiveness. The study provides a decisive view of the prostate cancer therapeutics market by segmenting the market based on product type, distribution channel, and regions. All the segments have been analyzed based on present and future trends and the market is estimated from 2018 to 2024. Based on product type, the prostate cancer therapeutics market is segmented into hormonal therapy, chemotherapy, targeted therapy, and immunotherapy. The hormone therapy is further segmented as luteinizing hormone-releasing hormone (LHRH) analogs, luteinizing hormone-releasing hormone (LHRH) antagonists, and anti-androgens. Based on chemotherapy, the prostate cancer market is segregated as Jevtana, Mitoxantrone, Taxotere, Estramustine, and others agents. Based on the distribution channel, the market is segmented as a hospital pharmacy, retail pharmacy, and online pharmacy. The regional segmentation includes the current and forecast demand for North America, Europe, Asia Pacific, Latin America and Middle East & Africa with its further divided into major countries including the U.S., Rest of North America, U.K., Germany, France, Italy, Spain, Rest of Europe, China, Japan, India, Southeast Asia, Rest of Asia Pacific, Brazil, Rest of Latin America, GCC Countries, South Africa and Rest of Middle East and Africa. This segmentation includes demand for prostate cancer therapeutics market based on individual product type and distribution channel in all the regions and countries. The report also includes detailed profiles of end players such as are Amgen, Inc., Pfizer, Inc., Johnson & Johnson, AbbVie, Inc., AstraZeneca, Bayer AG, Sanofi, Ipsen Group, Dendreon Corporation, and Endo Pharmaceuticals, Inc.